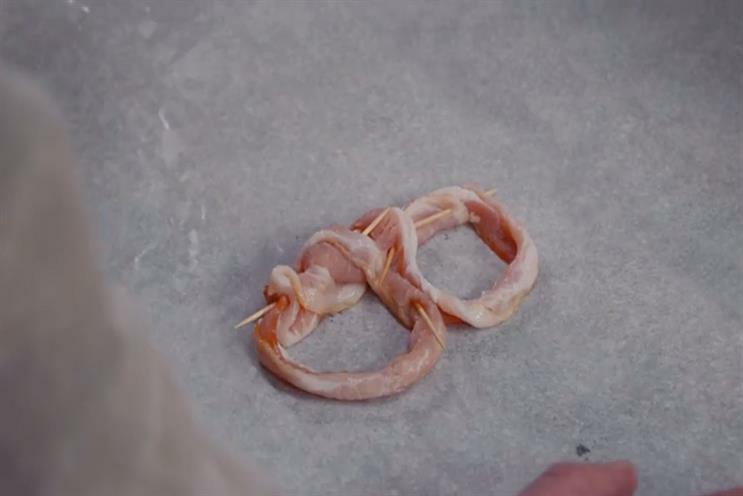 Lapiz, the US creative agency,, has devised a strategy to "improve" the experience of reading film subtitles by making the words out of bacon. Lapiz, part of the Leo Burnett USA group, launched the meaty typography concept in a "mockumentary" at the Chicago Latino Film Festival, which officially debuts today (10 April). The 90-second YouTube video explains how the agency spent a month creating words made of bacon that could be readable on screen. It also shows how the typographer who came up with the idea had difficulty making the letters without eating them. The movie Pork Chops/Carnitas, by Mexican director Bárbara Balsategui, was chosen to be the first movie with the bacon subtitles. It just so happens to tell the story about a girl and her new pet piglet. Bacon Subtitles: The Story of an American Font was art directed by Alexis Budejen and Ricardo Vallejo, and written by Roberto Luque. It was directed by Eduardo Cintron through Deboka Films. The festival will exhibit the sessions with Bacon Subtitles on 11 and 12 April at Chicago's AMC River East.